Some of us were born here, some are transplants from other cities and suburbs. But it doesn’t matter where we came from, just that we choose a life of wild seclusion, hard work and—above all else—true craft. There’s something that has infected our hearts, souls and minds: wild Montana. My return to Montana was just before the start of the most grey, dark winter I had ever experienced in my 33 years. One local told me it was the worst winter in two decades. I always knew I would come back having grown up splitting my time between Utah and Montana, but didn’t know I would bring with me years of textile production experience from which I could make a living. And I didn’t know I would soon meet and befriend a group of wild Montana women who not only live off the land, but have been perfecting their fiber crafts for years within the seclusion of heavily forested mountains. One, Siri Larsen, I met when she replied to my Instagram story of the country house I was living in when I first relocated to Whitefish, Montana. She told me she drives past the house every day heading into town from her home near the Canadian border. And she instantly became friends. Siri is unlike any woman I have ever met. Besides being kind, smart, hardworking, and ridiculously talented in spinning and natural dying, she also homesteaded land with her husband 22 years ago in the middle of nowhere. I mean, real homesteading. 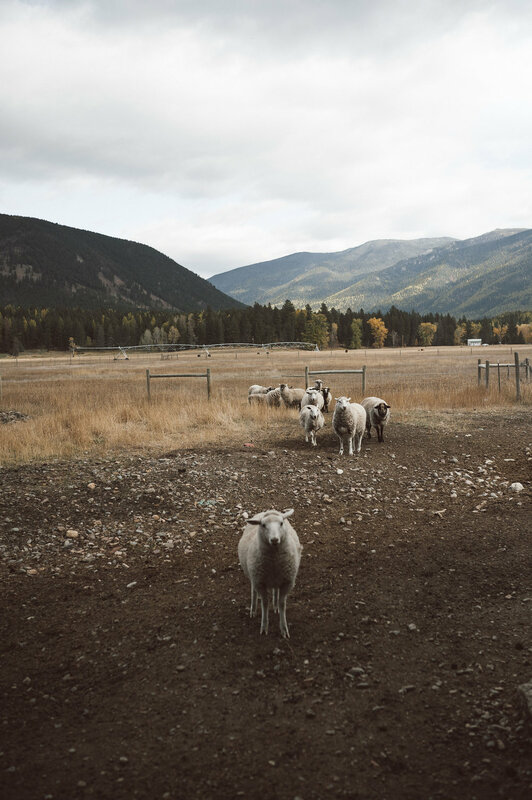 No electricity, no running water (which, I have come to find out is pretty common up here); she homeschooled her two wonderful boys, and somehow managed to raise the flock of sheep that started her wool business, Montana Woolen Works. Siri’s studio sits inside her hand-built home which is full of incredibly stunning hand-spun wool in all of the colors you can imagine. Some skeins sit next to the wood stove, some in wicker basket on the floor and some already being knit into socks, sweaters and hats. But Siri didn’t stop evolving her skills there; she has and continues to dye her wool, most recently with indigo dye baths. She is often found hiking and gathering plants out in the wilderness of Montana. She knows the woods and mountains like the back of her hands and casually tells stories of run-ins with grizzly bears. I have come to value not only her friendship, but also her incredible knowledge of living off—creating from—the land. And this creative through-line is what has come to interest me about this place. Wherever you turn, there seems to be deeply creative women who work with animals, dyes and tools passed down from generations to do their craft, make their art. A second, Ann Keenan of Pine Needle Farm Cashmeres, invited Lauren Lipscomb, the photographer who shot this piece, and me up to visit her and her goats in Kalispell. Instead of an address and the assumption that Google Maps could take it from there, Ann gave us a full page of printed directions. And after some pretty gnarly roads, we did actually make it to Ann’s house, an opening in the woods surrounded by fenced off partials for her cashmere goats and horse. Ann and her husband bought the land 20 years ago, where they lived in a canvas tent 365 days a year for 4 years with no running water or electricity. Now they have solar panels which feed their electricity and computer station in the corner of their hand-built home. Ann welcomed us onto her land with open arms and bags full of cashmere. Her goats are indescribably gorgeous. Mixtures of beige, black, cream, grey and even a few subtle hints of red. They were happy and eager to meet us, some more curious (nipping at our clothes) than others (staying as far away as possible). Watching the process that Ann goes through to get the wool off the goats makes her products seem priceless. She hand sheers, cards, cleans, picks out any remaining dirt or twigs, then finally spins the wool. The entire cycle takes weeks, sometimes months. Like Siri, Ann is self-taught in her expertise. Years of trials and tribulations have taught them both what works best in northwest Montana, where the summer days are long and glorious, leading to dark, cold and heavy snow-filled winters. It’s challenging enough to take care of yourself during a Montana winter, let alone a flock of vulnerable sheep or goats. Grizzlies are not the only predator in our backyards; wolves and mountain lions are just beyond the forest tree line, which makes living as we do full of a cautious wonder. When I spoke with Ann and Siri about why they think Montana is full of such dedicated craftswomen, I was reminded of the history of women in Montana—the women who endured the elements to not only raise a family, but animals from which they make their own clothing. But today’s women don’t do this because they have too, but because it fulfills them. Noelle Sharp, of APORTA Textiles, who wrote this story.